For forty-five years, from 1938 to 1983, the Tip Top Café was a popular college hangout, owned by Nick Arger and operated by Gert Johnson. In The Queen City, Ronald Goldman is a professor at Northern who hangs out there with his students. Since the Tip Top closed before I ever entered college, my memories of it are limited to one visit made there about 1980. I don’t know what I expected when she said that, but I did not expect what it turned out to be—a bar! My brother and Ronnie ran off to play the pinball machines (this was in the days before video games). Meanwhile, I sat in the booth with Ronnie’s mother, refusing to go play. College students were there and I’m sure they were drinking beer. I knew my mother would not want me in such a place. Besides, everything smelled of smoke—a clear sign it was an unsavory bar. We had fish which I barely ate—it tasted like smoke. I was embarrassed and ashamed because I felt I was doing something very bad by being there. I was much relieved when we left for the movies—we saw Mary Poppins—nothing I could complain about there, and Ronnie’s mom let us sit by ourselves right in the front row and buy gigantic sodas. When we got home, I felt I had to confess to my mom that we had gone to a bar, but strangely, she was a lot less concerned about it than me. In 1983, the Tip Top Café closed. The building was sold and became Ten O’Clock Charlie’s for the next several years before becoming Mainely Wood. Today, the building is home to Casualties Skate & Snow, a retailer of brand name snowboards and skateboards, both very popular in Marquette. Ronnie’s mom had said the Tip Top Café was a place everyone should experience at least once. I had my once, but if I’d had a second, I’m sure I would have liked it better. 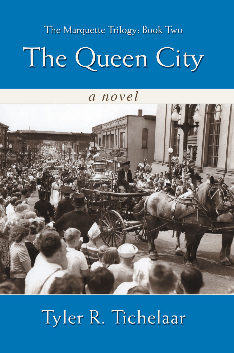 For more Marquette history visit www.MarquetteFiction.com. Today, April 18th, is the 105th anniversary of the Great San Francisco earthquake, an event I always associate with my ancestors. In 1905, my great-great grandparents, William Forrest and Elizabeth May (Zryd) McCombie moved to San Francisco where William’s sister, Margaret and her husband Louis Hansberry and her family lived. I don’t know why they moved, but most likely William went to work as a carpenter where he probably could have found more work to support his family. Five of his eight children: his oldest child Sadie, 24, and then the four youngest children, Raymond 14, James 11, Byron 7, and Burton 4 accompanied him. My great-grandmother Barbara, and her brother Joseph William Wallace were already married and stayed in Marquette, and her sister Eleanor was working for a family in Marquette, so they remained behind. When I was a boy of four years of age my parents moved to San Francisco in 1905, and lived there ten months. On the morning of April 5th at 5 A.M. 1906 we had the big earth quake. It cracked the earth all over a big area there and shook the ground and the furniture and stoves and stove pipes, soot and bricks came sown [sic] the roof and crashed thru the windows and a couple landed on my parents bed and I was lieing at the foot of the bed when a brick came down. My mother grabbed me and pulled me out of the way just in time. Buildings and homes were in ruins. Telegraph poles were bent way over and swaying. There were a lot of fires. My dad worked at tearing down buildings at $1.00 per hour. We were given free transportation and moved back to our home at Marquette. The McCombie’s experience was common for many. Free transportation was given to leave the city following the earthquake, although William must have stayed for a short time to help with the clean-up. Later, my great-grandmother, Barbara McCombie White, also wrote a short story that is a thinly disguised version of her family’s experiences during the earthquake. It also contains a story within a story that her father must have told her. I also have some short stories William Forrest McCombie wrote, and to discover my ancestors wrote stories, although not necessarily polished ones, was a great discovery for me. Here is my great-grandmother’s story about the earthquake. We lived in the little town of M-, Michigan. We usually had a long cold, winter with much snow. Sometimes when the snow plows went by the snow piled ten feet high. We had many snow storms and when a high wind accompanied it old Lake Superior roared and it was bad for shipped that happened to be out on the lake at that time as they were sure to be dashed to pieces. My father always longed for a warmer climate. About two years before the San Francisco Earthquake he expressed a desire to roam. I knew he was possessed of a roaving nature but did not dream he would ever go to California. We had often heard him speak of a sister he had not seen for about twenty-five years, who resided in the land of flowers and perpetual sunshine. It was rather sudden mother became aware of the fact that father was about to leave for the west. As he was a carpenter and builder he was very sure of finding work soon after his arrival. We all went down to the depot to see him leave and as he kissed mother good-bye, promised to send for the family before long. In due time we received letters from father telling about the nice climate and what a beautiful place California really was. He first wrote about Aunt Mary’s home and told of the large fruit farm she had, not far from San Francisco and how he met his sister Mary at the gate as she was about to go to visit her son who lived in Tiburn; she did not know him untill [sic] he spoke and said his voice had not changed in all those years. Father took long rambles over the mountains and he was quite lonely he saw a great deal of the surrounding country before he was there very long; he wrote about Golden Gate Park and how such a fine view of the harvor could be seen from the Berkeley Hills. It was a beautiful sight at night to see the many lights twinkling and ships from all nations in the harbor. He told about Golden Gate also. Father wrote often and told about the nice climate and beautiful flowers of many hues. I was so pleased with father’s accounts of California I was very anxious to go but my husband said we should wait and see how mother liked it. In October father sent for mother and the boys and sister Ellen. Ray was fifteen years. John twelve, Dewey nine and Harry three years; sister Ellen was seventeen years old. My eldest sister Sarah who was twenty-one wished to stay with me untill I should go and my eldest brother Will was married and lived in M- also. We all helped mother pack and get ready for their trip to the coast and with tears in our eyes sister Sarah and I bid them goodbye; little did we know what was to take place before we were to see them again. Father had rented a furnished house in the Island town of Alameda across the bay from San Francisco. We were anxiously waiting for a letter from the family and soon received word of their safe arrival in the Golden State; upon reading of their dangerous trip over the mountains I could feel the goose flesh creep up my arms; they told of the high cliffs on one side and deep chasms on the other where one could look down hundreds of feet below. The boys wrote of their fishing in the early morning and how they gathered clams after the tide went out. I enjoyed those letters and secretly hoped some day I too could view the beauties of that far western land. Every Saturday was marekt day in San francisco [sic] and the boys always looked forward to that time as they accompanied father to that busy, noisy city. Christmas was not far away and we were all very busy packing boxes for the folks away from home. It did not seem the same without mother and the rest so we invited Aunt Nellie and Uncle Bill over to drive away the blues. Many mysterious packages were brought out of their hiding places and little Robert was so delighted with the toys that he almost lost his appetite. The holidays passed and we settled down to work again and letters came quite often without any news untill [sic] the month of March mother wrote and told us she expected to spend the second week in April with Aunt Mary. I will never forget the day we read the papers. On the front page was written in great head lines, “Terrible Earthquake in San Francisco;” We read on, “At five-fifteen this morning thousands were rudely awakened from their slumbers by a terrible trembling and as folks who were not badly hurt ran out into the streets they saw many buildings topple over, many on fire. Great office buildings were shook to pieces and as the earthquake swept down Van Ness Avenue there was devastation everywhere. There was great fear among the people as fifty years before, when the last earthquake took place a tidal wave followed which swept everything before it into the bay. It was a strange sight to see everyone out in their night clothes, some praying, others screaming and waiting for they knew not what. Many homes were thrown from their foundations and others shattered so that the walls fell out and furniture slid out. I thought of my dear mother; was she among the dead? ; as I remembered her promise to visit with Aunt Mary Frost in that city. We read that dwellings on Webster St. were damaged, but to what extent we knew not and Aunt Mary lived there. How I prayed for their safety. For about four or five days we tried to send telegrams but as we afterward learned the wires were down around Alameda. We could only wait and hope. About the fourth day we were overjoyed to receive a letter from my dear mother telling briefly about the earthquake and they were all safe; she could not write much unnerved as she was but knew she must quiet our fears, also telling us that Aunt Mary was safe. The next day we received news of their coming home; as they were afraid of a famine all the people wished to leave the stricken district would be given free passage to any place in the United States. Words could not express our joy; sister Sarah and I joined hands and danced around like two crazy loons. They dressed and went out into the street which was thronged with people all very much excited and many in night-gowns. Mr. Bellon, the next door neighbor said he ran out when he was almost thrown from his bed and saw father’s house and theirs tip and touch and settle back on their foundations. There were fourty-two or three tremors in all. Sister Ellen had been working in a candy facotry in San Francisco and not knowing how extensive the work of the earthquake had been, took the ferry boat and went over to the city but was greatly surprised to see the city in ruins and was not allowed to land. In the afternoon father and Ellen went over to the city and as they walked around saw dead bodies stacked up like sacks of grain; they saw a chicken run out of a coop with scarcely a feather on. They called for volunteers and father responded as many men were needed to tear down buildings which were partically [sic] destroyed by the earthquake; whole blocks were blown up to stop the fire from traveling. Armed guards were stationed all over the city. Mother said the most trying time came when the family were obliged to stand in line in Oakland for three hours in order to get free transportation back to M–, Michigan. There was also a bread line which was about a block long. The authorities were glad to have as many refugees as wished to leave the earthquake district as they feared a shortage of food and the churches and hospitals were full of wounded and sick. There were so any underground passages in China Town of San Francisco, no one would ever know how many were killed as police in their raids were never able to explore them all. I have heard my father relate about the strange sight on Nob Hill on which hundreds of tents could be seen which sheltered those who lost all. Five hundred babies were born in these tents the day after the earthquade [sic]. Father was always willing to tell us of his experences [sic] while in the west but the story we liked best we will call “Shanghaied”, which I will tell as father related it to us. After a long tramp he found Alex Mack who had a chicken farm; upon learning that their names were the same, Alex concluded they were in some way related as they came from the same place in Scotland. I will put down Alex’s story as he told it to father. “About the year eighteen-hundred-forty great grandfather whose name also was Alex Mack shipped cattle to Liverpool. He was the largest cattle raiser in Scotland and lived in Inverness. He had a son Alex whom he sent on the schooner to Liverpool accompanied by Thomas Forbes to sell his cattle; as Alex loved strong drink foreman McLeod was sent along with them but Alex was trusted with the pay for the cattle. Alex and foreman McLeod loved the same girl, Jinnie McDonald. She loved Alex the best and as he had promised to leave whiskey alone she had promised to marry him, but he never stayed sober very long and spent a greater part of his time at the saloon when he was not buisy [sic]. For three years Jinnie waited patiently for Alex to change his habits. During this time John McLeod kept asking her to forget Alex but Jinnie was steadfast and always refused to listen to his pleasings [sic]. When John realized the situation he resolved to put Alex out of his way. Sometime later they again left on the schooner for Liverpool; a scheme had been planned to remove Alex from his path. After they had sold the cattle McLeod took the two youths to a saloon and after they became so intoxicated that they were in a stupor they were put on board a whaler named, “The Jolly Rover.” They were far out to sea before they realized the situation and the ship was bound for a three year whaleing cruise in the Northern Pacific. Between kicks and blows they scrubbed decks and did other work that was new to them and after a time became good sailors. Altho’ a longing for home gripped them they became accustomed to life on the bounding main. As they neared the South American coast they sighted whales. “There she blows,” was heard by several of the sailors. It was then the boys from Scotland experienced their first exciting work of helping to capture whales. Among the crew was a very grizzled fellow with a weather beaten face who seemed almost a giant in strength and was admired for his coolness, skill, audacity and cunning which he possessed in a superior degree. No whaler had been better armed. He had every known device from the barbed arrows of the blunderbus to the harpoon. He was prince of harpooners. He was called Mekie Alowa, altho’ no one knew his real name. Some folks said his mother had been a Hawaiian beauty and his father English. His father having been a sailor met and married his mother in Hawaiia and having made up his mind to settle down in England after five years sailing they started for England and the boat sprung a leak and went down and his father and mother were drowned and the sailors cared for the little orphan who was two years old at the time. He loved the sea and at the age of sixteen got his first whale. He had sailed on the Atlantic and the Pacific and was as much at home on a whaler as other boys would be in their own play rooms. They sailed around Cape Horn and had many exciting and dangerous experiences with whales and other monsters of the deep. When they sighted an island in the Southern Pacific the captain sent a few men out in a boat telling them to get fresh water. Among them were Alex Mack and Thomas Forbes and when they landed the sailor who had orders from the captain said, “Alex, you and Thomas go up that way,” indicating over a hill, “and we will go this way,” which was in a different direction. After the lads disappeared over the hill the rest of the sailors hastened back to their boat and rowed away leaving enough provisions for only a few days and an axe, as they never intended that the boys should leave the island. When Alex and Thomas took in the situation they made up their minds that McLeod had employed someone on the whaler to get them out of the way. They felt very much disheartened when they understood a trick had been played on them but set to work to make a shelter for the night after they had partaken of a portion of the food. Alex knew he had not lived as he should and vowed if he ever reached Scotland again he would show Jinnie he could be a man and let whiskey alone. They lived on birds and fish after the food was gone. The youths spent over two years on the island and in that time no ships had ever sailed near enough for them to hail, altho’ several times they saw a faint line of smoke and only once saw a ship in the distance. They grew to love the Pacific; it was vast and smooth and peacefull with swells like the mile long ridges of the desert. The lads looked every day for a ship and never gave up hope. They went to the other side of the island very often which was about three miles around. Every day they searched the shores for drift wood and they made a raft as it was their only hope of ever leaving the island. At last when it was complete they took what food they had which consisted of broiled fish and birds and drifted out into the great Pacific. After drifting for about two days they sighted a ship and were very glad as they had eaten the last of their food. One of the youths took off his shirt and tied it to the end of a long pole and signaled the ship. Words could not describe their joy as the big ship came nearer and the boys heard the boom of a big gun which told them they would soon be rescued as they neared the ship they saw it was a large freighter. Upon being taken aboard they related their story and the captain could scarcely believe them. The captain told them they were bound for Liverpool with a cargo of spices and silks and would give them money for their passage from their to Scotland if they proved good workmen while aboard. Alex Mack and Thomas Forbes reached Liverpool and the captain true to his promise paid them well and bought them clothes and as they were very anxious to see their folks again took the first boat home. Jinnie had never married so there was a wedding soon after they arrived. Captain Dobson of the “Jolly Rover” was found and punished for the part he played in helping to exile the lads. No, that’s not just a hill of flowers. That’s a house–Marquette’s first and only underground house at 1830 Altamont Street. This home was built in the early 1980s by the local business North Country Terra Dome, headed by Charles Sanford and David Drury. It was quickly dubbed “the Underground House” by the community. It was a new style at the time and believed to be the style for the future. 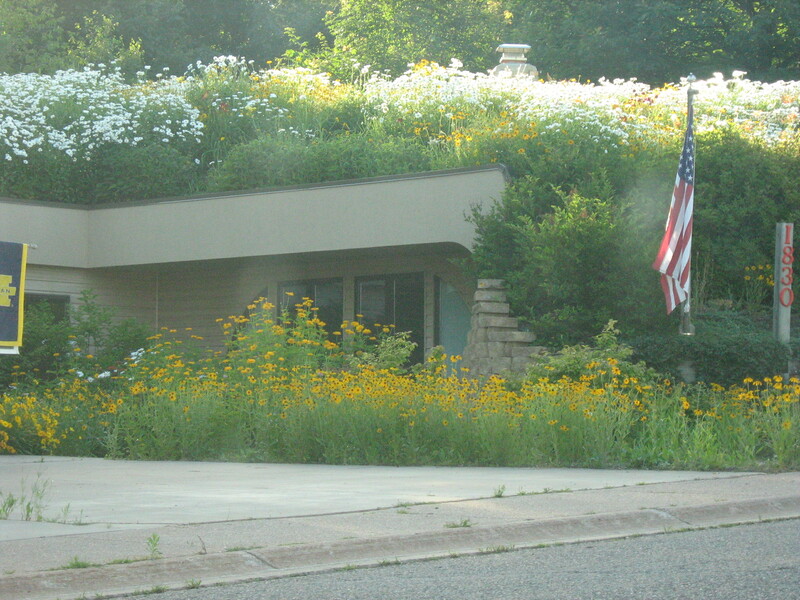 Built into a hill, its roof has a lawn that can be mowed, and the garage door opens out of the hillside. When it was first built, my mom, brother and I went to the open house. We were impressed by its ingenuity but not convinced we would want to live there. Most impressive was that although the house is underground, it does not lack for light. A skylight brings natural light into the kitchen and dining room and the front of the house, which is visible, along with the garage door on the side, has solar windows. 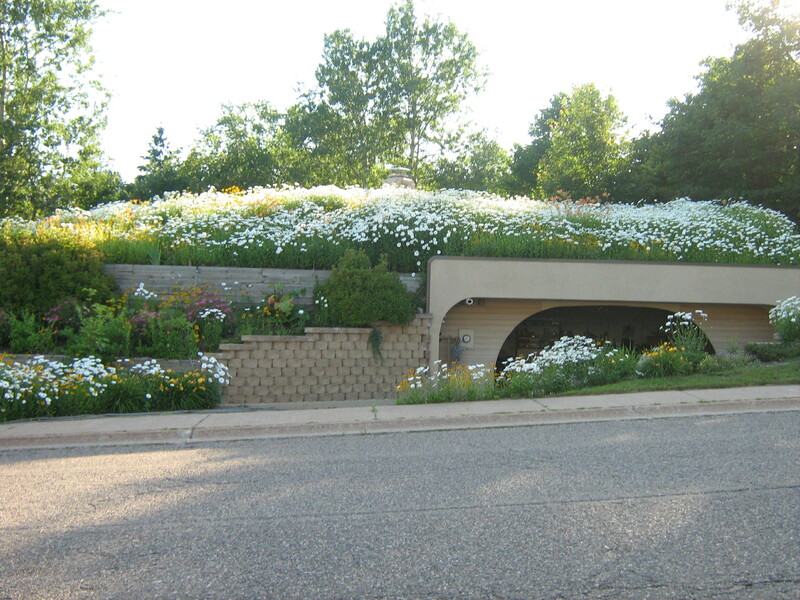 Another advantage is that following the great hail storm of June 2008 that did so much damage to Marquette buildings and vehicles, the Underground House was the only one on its street that did not need its roof repaired due to golf ball size hail. Today, the home belongs to Lorana Jinkerson, author of the children’s book Nettie Does the NTC: North Country Trail. When I asked her whether she would mind my photographing her house she told me that people do it all the time, stopping outside to take pictures of it and more than once she’s been contacted by newspapers and magazines that ran stories on her house. After thirty years, the Underground House remains something people talk about. 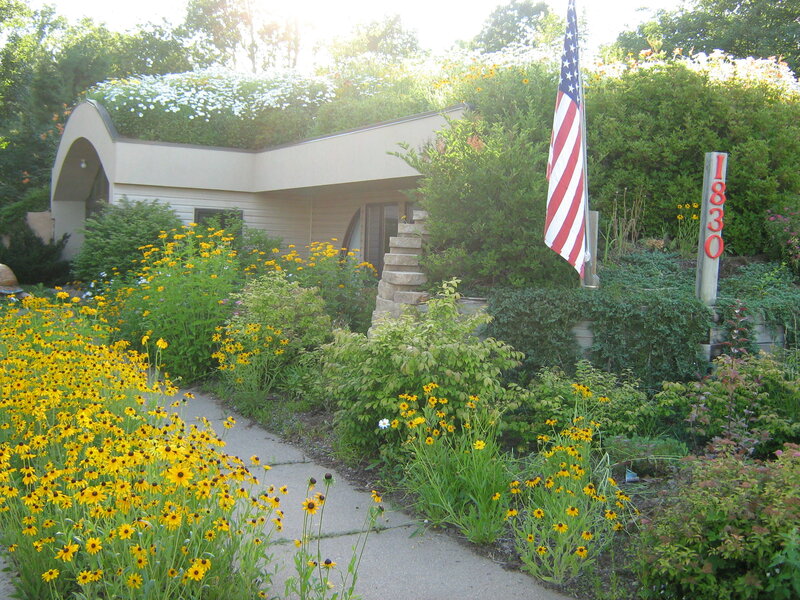 While the Underground House architectural style has yet to catch on in popularity, the recent emphasis on conservation, alternative fuel sources, and the move toward going green may just make the Underground House still a pioneer in a future architectural style. Who knows? In another century or so, we might all be living underground. Chewy and rich chocolate squares chock full of nuts, with a surprise layer of crushed pineapple. BAKE at 375 degrees F. for 45 to 50 minutes. 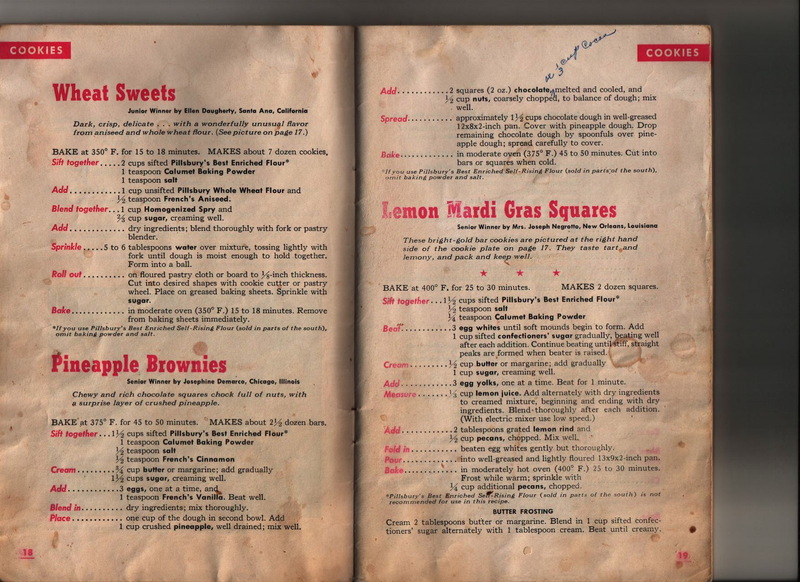 MAKES about 2 ½ dozen bars. 1 ½ cups sugar, creaming well. 1 teaspoon French’s Vanilla. Beat well. Blend in……….dry ingredients; mix thoroughly. 1 cup crushed pineapple, well drained; mix well. melted and cooled, and ½ cup nuts, coarsely chopped, to balance of dough; mix well. Bars or squares when cold. * If you use Pillsbury’s Best Enriched Self-Rising Flour (sold in parts of the south) omit baking powder and salt. 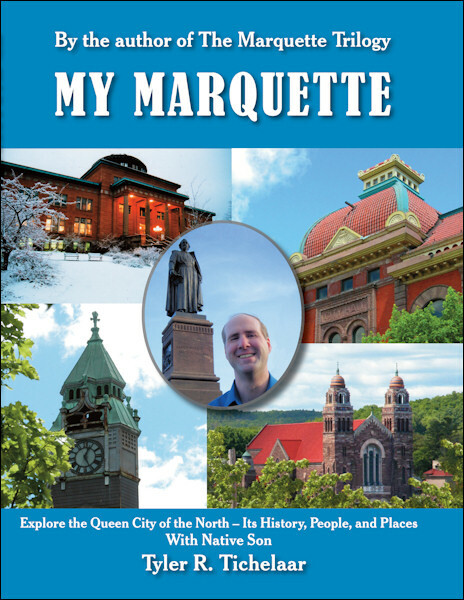 You are currently browsing the MY MARQUETTE weblog archives for April 2011.